“Janet Biggs: A Step On the Sun” opens this Sunday, September 10. 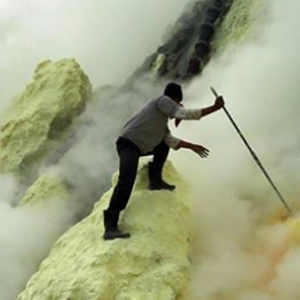 The artist’s recent video installation documents sulfur workers as they extract minerals from inside a fiery volcano—with nothing but bandanas covering their mouths. The miners scale the exterior of the active volcano, and then descend into its roiling interior to extract the sulfuric rocks and shards. The extraordinary video that results, “A Step On the Sun,” will be on view through December 22, 2017. For more information, visit http://bit.ly/2j2DvgQ.